My sister absent-mindedly googled our mother’s name “Sarah Gordon” the other day and was directed to the Australian War Memorial Archives. One link led to another, and she found this photo. It was captioned “Miss Mclean conducts children singing a song she composed on the voyage”. 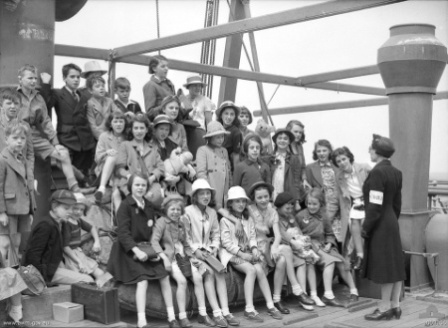 The voyage was a ship full of children being evacuated during World War Two. Children from London were being re-located to places like Australia, Canada and South Africa to protect their lives during the war. The date of this photo was 1940. My mother is in the front row, her right arm around the girl in the white floppy hat. Between 1939 – 1945 there were three major evacuations in preparation for the German Luftwaffe bombing of Britain. The first official evacuations began on 1 September 1939, two days before the declaration of war. By January 1940 almost 60% had returned to their homes. A second evacuation effort was started after the Germans had taken over most of France. From 13 June to 18 June 1940, around 100,000 children were evacuated (in many cases re-evacuated). When the Blitz began on 7 September 1940, children who had returned home or had not been evacuated were evacuated. From June 1944, the Germans attacked again by firing V1 rockets on Britain, followed later by also V2 rockets. One million women, children, elderly and disabled people were evacuated from London. Some of these boatloads of children did not make it to their destination. The City Line steamship, The City of Benares, sailed from her home port, Liverpool, on Friday September 13th 1940, an inauspicious day. On board she carried a very special cargo, children, 90 city kids whom their parents deemed would be safer overseas than facing the bombing at home. The ship was torpedoed by a German U-boat. 248 of the 406 people on board were lost, including more than 70 of the children. My mother’s ship made it safely to Australia, where she stayed with relatives until the war was over. She then returned to London, met my father, married and gave birth to me and my sisters. Later, in 1964, on the recommendation of my mother who had fond memories of her time in the big Southern Land, our whole family emigrated to Australia. During my last year of High School, a Hare Krishna devotee (Upananda) walked into the Indian handicrafts boutique where my mother worked, and purchased from her a set of brass vases for the first Hare Krishna Temple in the Sydney suburb of Potts Point, and she related to me the story. Later I met the Hare Krishna devotees, then in 1971 I met my Spiritual Master. This was a great turning point in my life. Such are the wanderings of the living entities.